Hist 133C homepage, Prof. Marcuse, UCSB History Dept. Dec. 12, 2005: this page superceded by my new Winter 2006 course homepage. 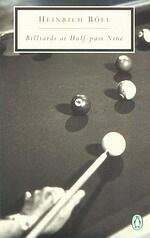 The 1992 edition is available for on-line checkout at the UCSB library. Oct. 26, 2005: This class will be offered MWF 11-12 this coming Winter quarter. 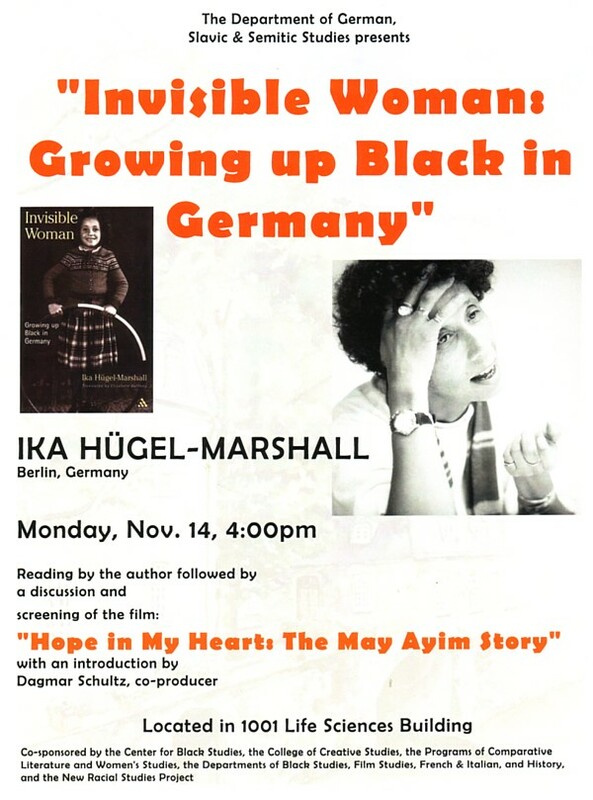 Interested students are encouraged to attend the Nov. 14 talk by Ika Hügel-Marshall: "Invisible Woman: Growing Up Black in Germany," followed by a discussion. 1001 Life Sciences Building. Ika Hügel-Marshall's translator, Dagmar Schultz, is also the co-producer of a 28-minute film, "Hope in my heart: The May Ayim Story", which is a documentary on the life and untimely death of Afro-German poet May Ayim. 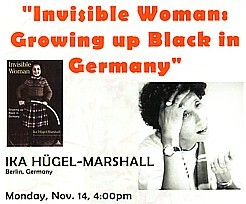 The film will be screened following Ika Hügel-Marshall's lecture. Dagmar Schultz will introduce the film and be available for the discussion afterwards. 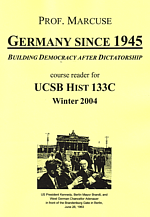 See also my "Other Courses" page, with annotated links to other post-45 Germany courses. March 30, 2005: I've finally added Ursula Ginder's paper on Nazi Art exhibitions to the projects page. Mar. 24: I've updated the web projects index page, and finished formating the essays. If you notice mistakes or have suggestions, please let me know. Mar. 24: my office hours for spring will be: Wed. 1-2 and Thu. 11-12. Please note my grading policies, below, and that you are welcome to come to my office and pick up your work. Thank you all for your participation--I enjoyed the course in spite of my very hectic quarter, and I am looking forward to working with some of you in my 133p proseminar (20022004 website) during a somewhat more relaxed quarter (for me) this spring. Added Dec. 5, 2004: Interested in grade inflation since the 1970s, all across the USA? 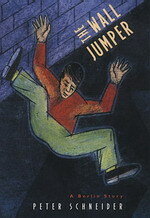 Peter Schneider, The Wall Jumper (1983). This novel evokes the situation in divided Berlin in the early 1980s, and attempts to show some of the positive sides of life in East Germany. PT2680.N37 M313 1983. Germany was one of the United States’ main enemies in two world wars prior to 1945, but by the early 1950s it was well on the way to becoming our most reliable ally in Europe, a "bastion of democracy" buffering capitalist western from communist eastern Europe. How was this turnaround possible? This course pays special attention to the process of development of German political culture after 1945. L19: Dissent in West Germany midterm evaluation. East German propaganda documents, at an excellent site created in 1999 by Randall Bytwerk at Calvin College in Grand Rapids, Michigan. Dec. 15, 2003: web site still under construction. Jan. 4, 2004: Note that the class meets in Building 327, rm 104 (across the parking lot from the MultiCultural Center end of the UCen, near the Psych building), MWF at 9am. Jan. 7: I've asked the bookstore to order 18 copies of the textbook. Lecture 2 outline available (link). Jan 12: textbook update: The UCEN bookstore expects them Jan. 23, but sometimes the publishers ships them in lots of 2-3, and they arrive earlier. If you prepay, they will call you as soon as the books arrive. The University of Bristol (UK) has a page with party logos linking to their homepages (sorry, in German) (link). Jan. 13: electronic copy of textbook available through our library's pegasus (link - search "Fulbrook divided nation" gives you two copies, one electronic). The title link takes you to netlibrary, where you give yourself a login and password. If you just "browse" it (you can type in page numbers in the upper right), others can use it at the same time; if you "check it out," no one else can access it. Jan. 17: the textbook is now available in the UCEN bookstore; Böll handout available (hard copies outside my office door); for paper/book essay topic see also the section below. Jan. 22, 2004 Reviews for book proposal: Several students have had difficulty finding reviews of their books. If you can't find any, submit what you have, and say how you attempted to find reviews. If I still want some, I'll tell you and make suggestions about where you might find them. Jan. 22: L7-Experience of defeat added. For Friday, be sure to read the assigned pages in Fulbrook, and think about who is responsible for the Cold War. Jan. 27: Reminder: Q4 on Wednesday will be drawn from the Böll reading. Feb. 2: L12-1960s now available. Q5 on Friday will be based on the film shown Wednesday (The Promise, see imdb; available on amazon). Feb. 7: please note that the book essay summaries and drafts are due on Monday, 2/9/04. Feb. 7: L14-60s Foreign Policy now available. Feb. 9: A handout for The Reader will be was distributed in class. For background, see this 1997 interview with Schlink by Ron Hogan. A 1998 interview offers some interesting detail about Schlink's life. 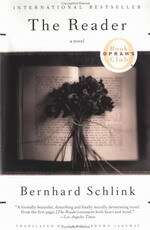 Random House has information about Schlink's next book Flights of Love, a collection of seven short stories published in English in 2002 (link). A set of questions is also posted on the internet (readinggroupguide; also on amazon). Feb. 17: L17-Nazi Past, 1960s-80s now available, also midterm evaluation form for 2/1820/04. Feb. 19: L18-Arguing Theses now available (without images). Be sure to read Schneider, The Wall Jumper for Friday, 2/20. Q7 will ask what his main thesis is. 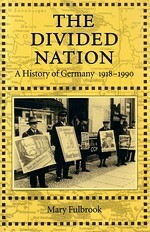 Feb. 20: L19-Dissent in West Germany now available (images in progress added 2/22). Feb. 23: web option handout available. Feb. 24: L20-DissentStasiState available. Be sure to read sources #12 & #13 for Wed.
Feb. 25: Two talks coming up. Submit one paragraph describing what it was about, and you can get up to 4 points per talk extra credit. NOTE: no more make-ups Qs will be possible--this is your chance. Robert Krell survived the Holocaust as a hidden child in Holland. Eventually he became a noted child psychiatrist recognized, in particular, for his scholarly research and public lectures on the psychological trauma in Holocaust survivors and their children. He co-authored an updated, translated edition of Judith Hemmendinger Feist's book, The Children of Buchenwald: Child Survivors and Their Post-War Lives (2000) which recounts the story of the 426 young survivors sent from Buchenwald to France. Feb. 12: Class mailing list "hist133@mail.lsit.ucsb.edu" now operational. First, go to this site: https://mail.lsit.ucsb.edu/mailman/listinfo.cgi/hist133 to enter your e-mail address and give yourself a password. Next, check your e-mail and respond to the automatic message (usually, "reply" will work) to confirm your address. Mar. 1, 2004: L21, L22, L23 (all about building a mass movement and the fall of the Berlin wall), and chronological handout added (no images yet). Mar. 4: For Friday, 3/5, be sure to read the Bornemann essay #14 in the reader, and Fulbrook chap. 13 on the East German revolution. L24 (no images yet) also added. Mar. 5, 7:40am: late-breaking clarification: Yes, the book summary can (should) be integrated into the final version of your paper. If you did not do this yet, don't worry, since those of you NOT doing the web option will be submitting the prospectus and the previous draft version, I can read it there. Web option: please only submit the hard copy version I returned to you this week, plus a disk or e-mail with the electronic version. Non-web: If you don't have exactly the right things with you, don't fret. Turning in the final printout in class ensures that you made the deadline. You can submit the rest this afternoon or Monday. Mar. 9: If we have time after the presentations, we'll do Q10 on Wednesday (3/10). Read Chap. 14 of Fulbrook, esp. from p. 357 on. What factors contributed to the stability of the post-1945 German states? Mar. 11: FALSE ALARM: I found all of the corrected Krell-extra credit submissions. I'll return them on Friday. Mar. 13: The take-home final exam will be available on Wed., 3/17, at noon on this site and at my office (check the envelope outside my door if I'm not there later in the afternoon or evening). It is designed to take only 2 hours (see exam study guide). It is due on Thu., 3/18, by 11am in my office, HSSB 4221. Mar. 13: I will be out of town until Tuesday late, so there will be no more updates to this site until Wed., 3/17, morning. I may be able to respond to e-mail Monday (3/15) night. Mar. 13: L28-Conclusion now available. Mar. 17, 2004: the final exam is available: html; pdf version for printing. Due March 18, by 11am in my office, HSSB 4221. Analysis: 33 students were enrolled in the course. Thus each student checked this site about every 3rd day early in the course, about every 2nd day mid-way through, and almost every day at the end.